The Winter Town, historical district with its elegant XIX Century villas. Self guide visit on foot or accompanied by the Tourist Information Office. The Spring Town located in the Sainte-Anne des Abatilles spring area lined by the large Pereire beach and walking promenades. You will enjoy an exceptional point of view on the Arcachon Bay, the Cap Ferret tip and the Arguin Bank. The highest dune in Europe: 106,6 m high (direct dial: +33 5 56 22 12 85). 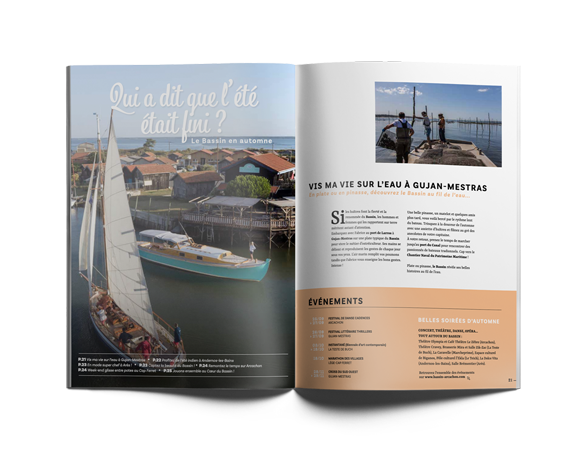 A commented boat trip is available with the UBA (Boatmen Union of Arcachon) in the peaceful internal waters of the Bay (direct dial: +33 825 27 00 27). Observe the birds at the Reserve. A pretty 6 km walk will give you the chance you to observe 300 recorded bord species. The route is suitable for persons with disabilities. €6.80/child, €9/adult (direct dial: +33 5 24 73 37 33). You will adore the Leyre River. Paddle at your own pace for a half or a full day with a picnic. €15-€19/person. We invite you to discover these places with those who assure their preservation! Join the fish auction and market (direct dial: +33 5 57 52 97 97). Immerse yourself in the experience of fisherfolk : an original way to discover oyster farming or sea-fishing and the traditional skills of the Bay. €45/person. We invite you to immerse yourself in the experience of fisherfolk! Besides the walking guided tours suggested by the Tourist Information Offices, get the “topoguide” booklet: “le Tour du Bassin à pied” (for sale at 8€ at the Offices) for you to find out about our great country hikes. The Bay towns are connected by a 220 km cycling track network at your disposal. You will be surprised by the diversity of the Bay’s beaches: on the Ocean, on the Bay and along Cazaux Lake’s shores and creeks. 76 km of beaches of which more than 40 km to the open sea (the “Grand Crohot beach” in Lège-Cap Ferret, the “Lagune beach” in La Teste de Buch...). Each morning, you can find a market in one of our 10 towns. After lunch, take advantage of your free time to enjoy an ice cream at our piers feet: in Arcachon, the Moulleau, the Cap Ferret and Andernos-les-Bains with the longest jetty of the Bay. Play around at one of our theme parks. Spend the day on an island of fine sand, surrounding by the colours of a lagoon: the Arguin Bank. Except from a marked out protection perimeter, the reserve has free access all year round, under the attentive gaze of the reserve guardians. Thank you for helping us taking care of this nature area! During July-August, the UBA boats disembarks you on a fine sand island, classified as "Nature Reserve". Enjoy a walk in the Andernos-les-bains channels at low tide or snow crab in the Lanton harbour, at the heart of the Arcachon Bay. There are 80 WiFi hotpots available to stay connected during your holiday! 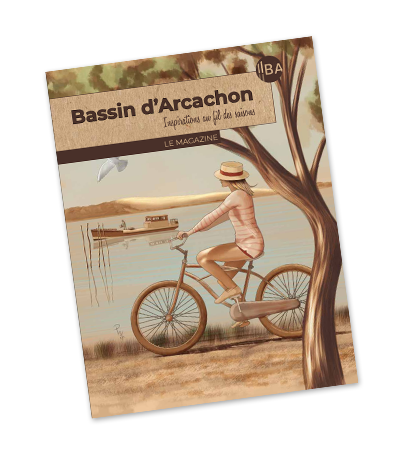 Download the Arcachon Bay mobile application. It's very useful during your stay! Book a “Naturally Basin”-accredited holiday rental or guest room with one of our local hosts! 220 km of cycle paths and 15 ideas for circuits to forget your car during your holidays. 220 km of cycle paths and 15 ideas of circuits to put the car during all your holidays.